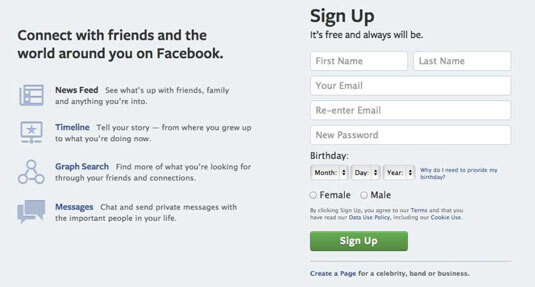 Officially, all you need in order to join Facebook is a valid e-mail address. Valid means that you need to be able to easily access the messages in that account because Facebook e-mails you a registration confirmation. First and Last Name: Facebook is a place based on real identity. Sign up with the name people know you by. Signing up with a fake name or alias is not recommended because that will make it hard for you to be found by friends. After you’ve signed up, you can add nicknames or maiden names to your Timeline to make it even easier for friends to find you. Email: You need to enter your valid e-mail address here. Facebook asks you to enter your e-mail twice to make sure that there are no typos and your e-mails will actually get to you. Password: Like with all passwords, using a combination of letters and numbers is a good idea for your Facebook password. It’s probably not a good idea to use the same password for every site you join, so use something unique for Facebook. Birthday: Enter your date of birth. If you’re shy about sharing your birthday, don’t worry: You’ll be able to hide this information on your Timeline later. Gender (Female or Male): Facebook uses your gender information to construct sentences about you on the site. Especially in other languages, it’s weird to see sentences like “Jennifer added a photo of themself.” If you want to hide your gender on your Timeline, you can do so after you sign up. After you fill out this information, click Sign Up (that’s the big green button). Congratulations: You officially joined Facebook!